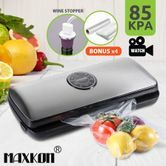 Save time and money by never letting your food go bad again when you order this MAXKON LED Vacuum Sealer Food Saver! Vacuum packaging keeps food fresh up to five times longer than other traditional food storage methods. A vacuum food sealer prevents problems such as oxidation, dehydration, mould formation, bacteria growth and freezer burn. For the busy family, you can prepare make-ahead meals over the weekend, store them in the freezer, and then simply reheat them for weeknight! This vacuum sealer is also ideal for protecting valuable items such as photos, documents, stamps collection, gold and silver from tarnishing and oxidation. Easy to use, easy to clean and always convenient for a variety of household uses; order your MAXKON LED Vacuum Sealer Food Saver today! Excellent service Great people to deal with. Thankyou .